A new Humble Bundle is available for mobile gamers, packed with great titles for low prices. Not only do you get great games, but when purchasing a bundle, you can select how much of your purchase price goes to the game’s developers, select charities, and a tip to the Humble Bundle service. 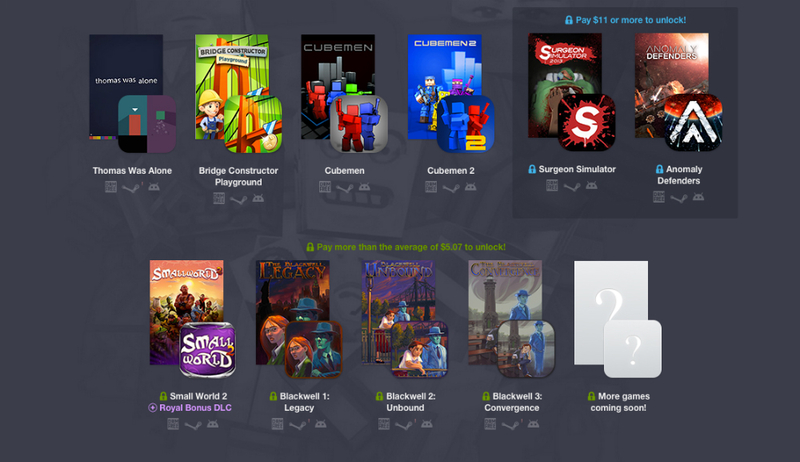 Included in this bundle are a few awesome titles, such as Thomas Was Alone, Cubemen, Cubemen 2, and Bridge Constructor Playground. While those games are fine and dandy, it is the titles you unlock by paying more than the average of $5.08 that are really awesome, which are Small World 2, Blackwell 1: Legacy, Blackwell 2: Unbound, Blackwell 3:Convergence, and more to follow. If you happen to pay more than $11, however, you also unlock Surgeon Simulator and Anomaly Defenders. All of these games only for $11. Not bad at all, right? If you want a few great games for a low price, while also helping out a few charities, check out Humble Bundle 11 by following the link below.